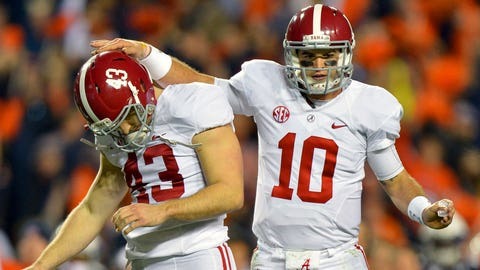 Cade Foster took a lot of heat after Alabama lost to Auburn a few weeks ago. The senior kicker missed two field goals in the 34-28 loss and had another one blocked. Foster received several threats after the game. Since then teammates and fans have gone out of their way to show their support for Foster. Now he has the support of a former president. Foster showed off this note from George W. Bush on his Instagram account Wednesday. The note says: "Dear Cade (#43), Life has its setbacks. I know! However you will be a stronger human with time. I wish you all the best- Sincerely- another 43 George Bush."